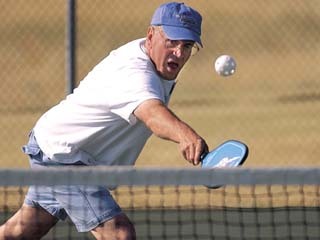 What is pickleball? It’s one of the fastest-growing sports in the country, a hybrid of table tennis, badminton and tennis. Pickleball is played on a badminton-size d court with the net lowered to 34 inches at the center, using a perforated plastic ball (similar to a whiffle ball) and wood or composite paddles. It is easy for beginners to learn, but can develop into a fast-paced, competitive game for experienced players. Pickleball originated in Bainbridge Island, Wash., and was named after Pickles the dog, who would chase the ball around the court. Much of the growth in the sport is due to the millions of Baby Boomers who are entering retirement age and wish to remain active. Sunday, Monday, Tuesday and Thursdays 2-4 p.m.